Compliant to USB 3.0 SuperSpeed Specifications. Connect Your SuperSpeed USB Peripheral for TEN TIMES the Transmission Rate of USB 2.0! Just plug-and-play for hard drive enclosures, printers, modems, cameras, and other SuperSpeed USB peripherals. 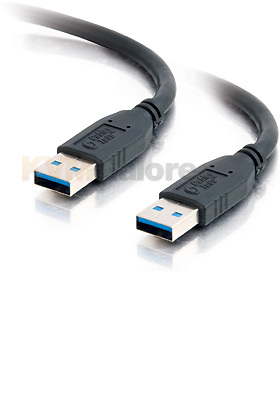 This cable provides a transfer rate of up to 4.8 Gbps when connected with a USB 3.0 compliant host and device. Foil and braid shielding reduces EMI/RFI interference and twisted pair construction helps reduce crosstalk thus ensuring SuperSpeed, error-free data transfer. Protective overmolded connector is color-coded blue to highlight USB 3.0 connectivity compatibility.